Italian Ricotta Peach Cookies with a sweet ricotta filling will look beautiful on your holiday cookie trays & are a show-stopping dessert recipe for any occasion! Peaches are a spring and summer thing normally, but any kind of Italian cookie just screams “holidays” to me! I like to make a huge tray of a variety of Italian cookies for Thanksgiving and Christmas and everyone always goes crazy over them. Pies aren’t really my “thing” as much as cookies and bars are and everyone always counts on me for the Italian desserts. I’m not sure I would be allowed in the door at a holiday event without my cookie tray! 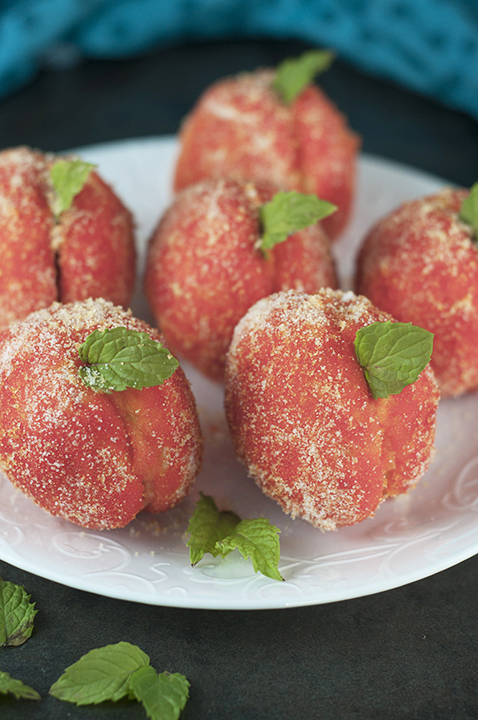 These Italian Ricotta Peach Cookies are where it’s at. The more I got into cooking and baking over the years, the more I realized the importance of the quality of the ingredients I use. You may not think so, but it really makes a difference in how your dishes turn out! I have no problem spending a little extra at the grocery store on ingredients if it means the taste will be greatly improved. Totally worth it! 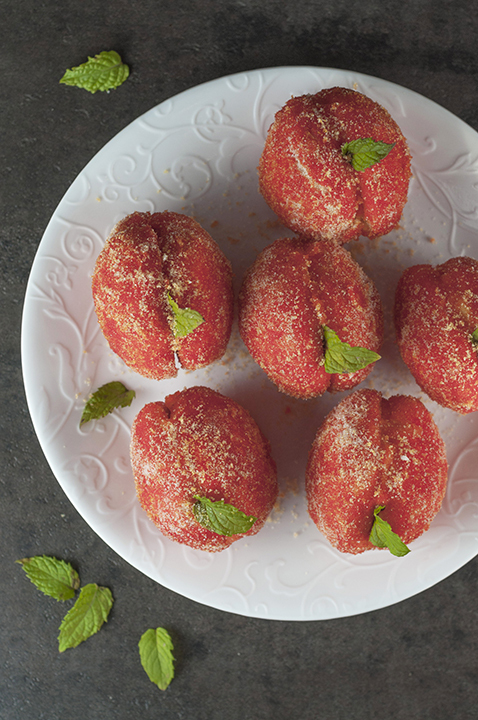 Finlandia™ imported butter is one of the ingredients that can enhance the flavor in any sweet or savory dish you are making and what I used in these Italian Ricotta Peach Cookies. Using the best butter is especially important when I’m making a dessert that I am bringing to a party or get-together! 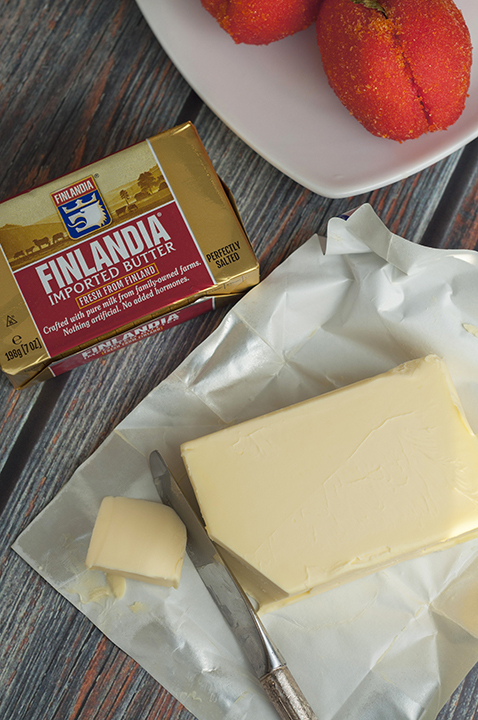 I really like to step up my game when I’m serving my creations to others and Finlandia butter helps me out with that mission. Amazing, high-quality butter makes all the difference whether you are baking with it, cooking with it, or just spreading it on baked goods – I promise! I only wish I had discovered this baking trick sooner in life. Besides butter, Finlandia also offers other delicious, high-quality dairy products made from pure ingredients and nothing artificial, such as their cheese and creamy gourmet cheese. They have been making cheese and butter in Finland for over 100 years and are well known for their Swiss cheese which was the first product sold in the US! You all know my obsession with cheese, so this is definitely on my list of cheeses to try soon. Their products have no added hormones and are made with the purest milk from Finnish family-owned farms and the taste really is unparalleled. Farmers who treat their cows like loving family are my kind of farmers, am I right? I really think you should try this butter, possibly even make these Italian Ricotta Peach Cookies, and notice the difference for yourself! I can’t tell you how blown away people will be at how these Italian Ricotta Peach Cookies look like actual real peaches. If you’re doing any sort of bake-off or contest for the holidays I can almost guarantee these will win an award – at least definitely for most-impressive looking! 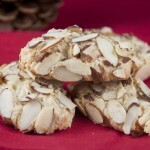 They are very much edible art in cookie form and one of my favorite cookies to make (and eat). The crunchy sugar coating enhances the cookie’s citrus aroma, and the orange-infused filling make these an absolute show-stopper. They are moist in the inside from the ricotta filling and slightly moist on the outside from the coating of color. Tip: These yummy Italian Ricotta Peach Cookies are about the size of a small plum when halves are put together, for your reference. 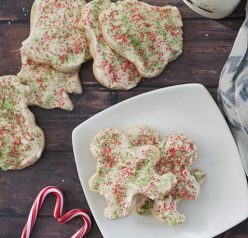 If you’re loving the Italian holiday cookies as much as I am, you might want to check out the recipes for others I have made: Italian Ricotta Cookies, Italian Anisette “S” Cookies, Italian Lemon Drop Cookies, and Grandma’s Almond Macaroons. Enjoy! Italian Ricotta "Peach" Cookies with a sweet ricotta filling will look beautiful on holiday cookie trays & a show-stopping dessert recipe for any occasion! In a medium bowl, whisk the ricotta cheese together with sugar until smooth and well incorporated. Cover and chill the mixture in your refrigerator while you make the cookies. Preheat oven to 350°F. Line two baking sheets with parchment paper or silicone baking mat and set aside. Sift flour and baking powder together into a large bowl. In another bowl, whisk the 3 eggs and sugar until combined. Whisk in milk, melted butter and lemon zest until smooth. Slowly mix the dry ingredients into wet ingredients, one cup at a time, until well incorporated. Finish mixing the dough with your hands, if necessary, and form it into a ball. 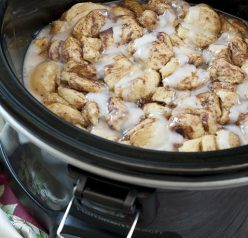 If it’s too sticky add another tablespoon or two of flour until it sticks together. Let rest for 5 minutes. Using your hands, roll the dough into 42-45 evenly sized balls and transfer them to the prepared baking sheets. Give about 1-2 inches between cookies so they have room to spread. Press down each ball slightly with your fingers so it flattens a bit. Bake the first round for about 14-15 minutes or until bottoms are golden brown -the tops will still be light in color. Rotate the pan halfway through baking for even cooking. Repeat with second pan of cookies. While the cookies are still warm (this is important that they are still warm), carve out a circle in the bottom of each cookie with a knife or spoon and have enough space for it to hold the ricotta filling. Don't go too deep or cookie will fall apart. Set aside. Repeat with the second pan of cookies. Choose two cookie halves that are the same size and set them aside together. Fill each cookie hole with ricotta filling to fill the hole, but not overflowing too much or it will seep out (about a teaspoon). Press the two flat sides of each half together and gently wipe away any filling that oozes out at the edge. Brush each peach with food coloring, gently roll it in sugar that you have placed in a bowl and place on a large plate to dry. Chill cookies, covered with plastic wrap, for a few hours before serving. This will harden the ricotta and moisten the cookies. Decorate the cookies with small mint leaves before serving, to look like peach leaves, if desired. Serve them at room temperature. Enjoy! These are just so great!!!! I am bookmarking this because I love foods that are cute and that look like other foods, and you are meeting the bill here. 🙂 On both counts! Ashley, I’d go crazy for these too! They not only sound delicious but they are super adorable too! Hello, I’d like to make these, but have a question about your measurements. For the milk, did you use a liquid measuring cup or a dry measuring cup? There’s a difference, and I’ve noticed that many internet recipes use one type of cup for measuring everything. This recipe sounds so good that I don’t want to mess it up by using the liquid measuring cup for the milk if you based the recipe on using the dry cup for measuring milk! Hi Mary! I always use the liquid measuring cup for the liquids. You’re right- it does make a difference! I love these, they look so yummy! These cookies are amazing – you would have totally fooled me if you didn’t tell me they weren’t real peaches! What?! These are gorgeous, girl! LOVE! OMG these are the cutest things ever! You are so creative! These are gorgeous! I seriously had to re-read everything to make sure they weren’t real peaches, I mean they look so real to me! Great job! Oh my gosh, these are AWESOME! Seriously, the cutest cookies ever, and they sound so delicious. 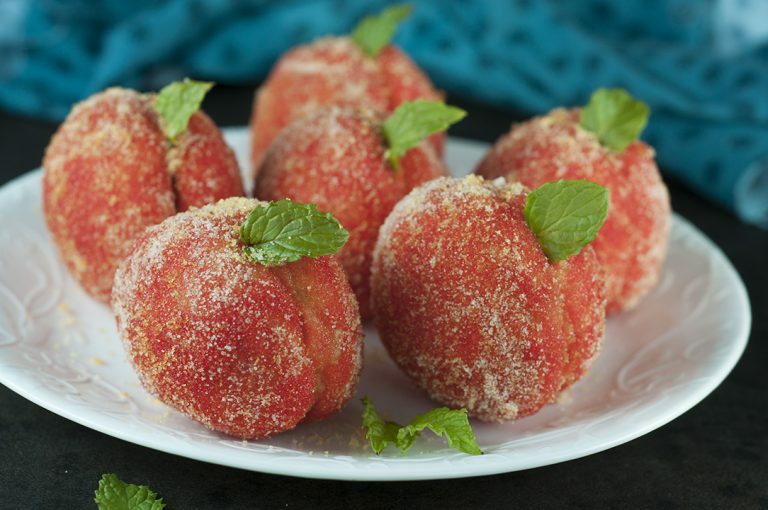 Oh my gosh, I seriously thought these really were real peaches rolled in sugar – stunning! And I’ve GOT to try that Finlandia butter!! These could not be more adorable! They would be just lovely for the holidays! These are so sweet! I’ve never seen anything like them! I’d love to have these on my holiday table! Such gorgeous cookies and so pretty and festive for holiday baking!! Ashley!!!! These peach cookies are amazing! I love that they actually look like peaches! Gosh, these are so cute!! 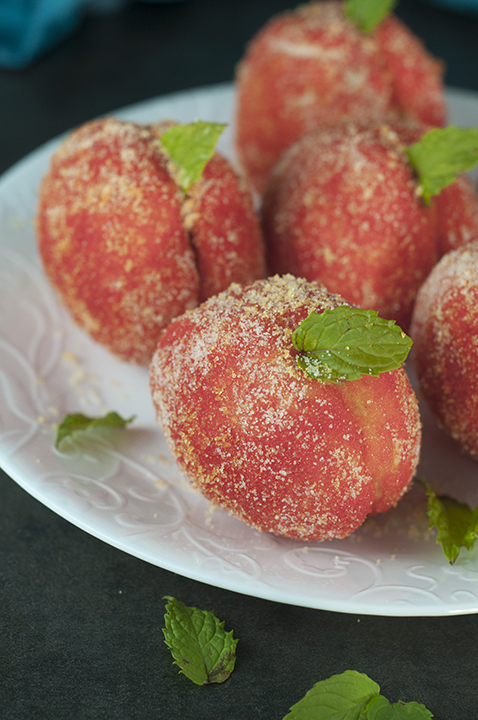 They look just like peaches – so fun and sounds totally delicious. What a serious treat for the holidays! These cookies look great and sound delicious. 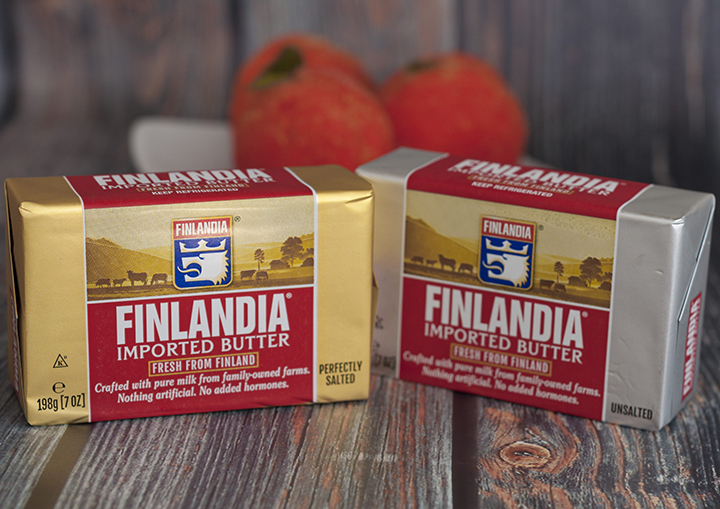 I will try the Finlandia butter as you suggest if I can get it in Toronto. I really wish you could make a video of the production of these cookies. It would help in getting the correct proportion for cookie size, in scooping out the interior… (do you scoop out both sides?) and mostly in the colouring of the cookies. I have never painted cookies with food colouring before and would like to watch you do it so I don’t get too much on each cookie. Do you mix the red an yellow together or do you colour the yellow on first and then top with the red?